Welcome to muhdnurhidayat's English website. I'm now using Blogger because of continuous frustrations on free hosting hitting CPU limit. This is continuation of my previous post where I wrote about the hardships of going to watch anime movie in cinema in general. Now, I'm writing on my journey to watch them. I'm a student of public university and I'm fully depending on my study loan for everything from textbooks to study fee, daily foods to internet reloads. I live in the residential apartment of my university, which also has that rules of no part-time jobs allowed, and my parents could not send money to me as they're having issues with themselves and my little brother who is in primary school year six (elementary school or 6th grade) needs money for many activities in preparing for the first national examination he'll be facing, the Primary School Assessment Test (UPSR) which could affect on which school and/or even class he'll be going to on secondary school form one (junior high or 7th grade) later. Since the study loan was just enough to cover the basic necessities, I had to do unusual things like skipping necessities so I have enough money to watch the anime. Okay, to be honest, I skipped dinner! So that means I was just left with lunch everyday (I've never eat breakfast in my life btw). I'm studying (thus living) in Arau, Perlis and Perlis is known to be a state without any cinemas, alongside Kelantan. The nearest cinema is independently owned Jitra Mall Cinema in Jitra, Kedah. Yes, Kedah is another state but there situated the nearest cinema to Perlis. It's a very small cinema as Jitra is just a small town. It didn't even screen anime. The second nearest cinema is GSC Aman Central Alor Setar, Kedah owned by GSC. It's rare that anime is screened there but it's not like there's no anime at all, just it's rare. It's situated just the opposite of Alor Setar Tower. The nearest cinema that did show almost all anime movies is actually GSC Gurney Plaza, Penang and yes, Penang is yet another state below Kedah. This means I need to go across another state to arrive yet the other state before I could watch anime movie. Now, let's look at how to get to the cinema that did screen the anime I wanted to watch. This movie was released on GSC cinemas in 9 February 2017 and it's only available in selected GSC cinemas and the cinema branches list is too few. 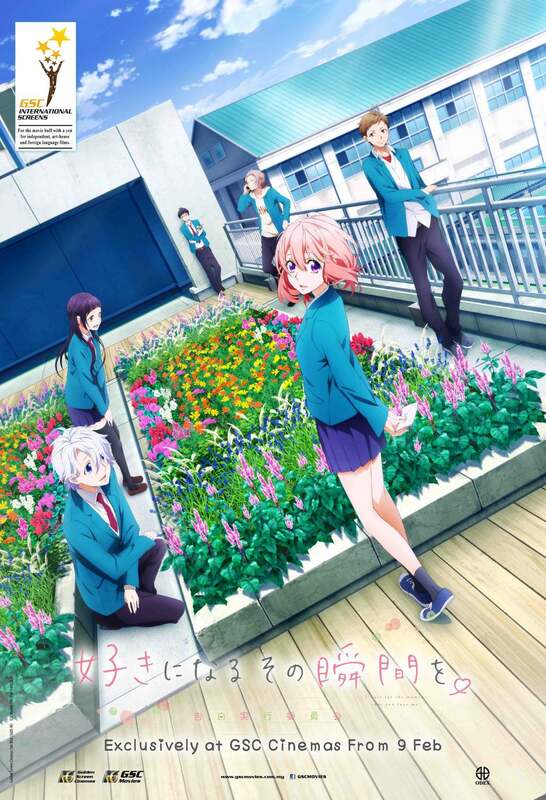 I'm studying (and thus living) in Arau, Perlis and the nearest cinema that did screen this anime is GSC Gurney Plaza, Penang. It doesn't screened in the nearer GSC Aman Central and who knows the reason. Here's a quick Google Map from Arau, Perlis to GSC Gurney Plaza, Penang. © Google, Inc. Screenshot under fair use. 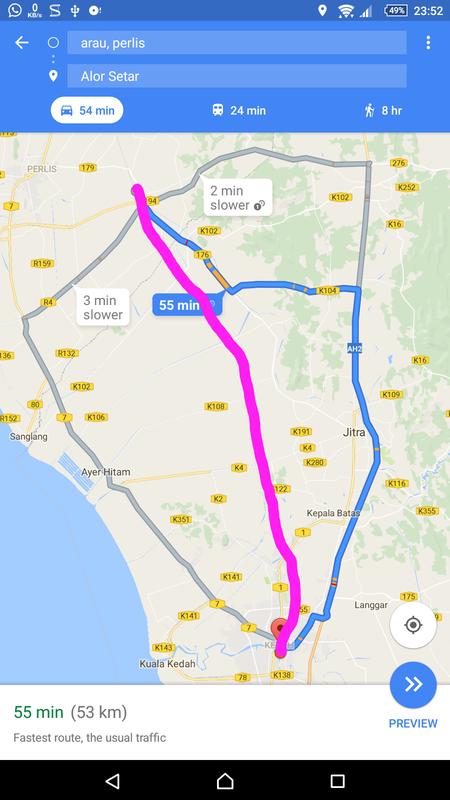 The suggested route by Google Map is for driving a car so it would just be 2 hours 12 minutes, which is not the case for me as I'm student and seriously I don't have any cars. Plus, I'm tight in budget. The only option for me is to use cheapest public transport, so no taxi, no Uber, no Grab. In my case, I need to take commuter train, a ferry and a bus, total time is 5 hours. I need to walk from my room in the university to Arau train station, which usually takes around 30 minutes to avoid the taxi which would cost me RM10 for that short distance. Then, I'll need to buy the KTM Komuter Sektor Utara (North Sector KTM Commuter) train ticket for journey from Arau, Perlis to Butterwoth, Penang and sit patiently for the train. By the way, this commuter is coming once in an hour, unlike commuter in other countries where it goes once in 5 minutes. I prepared to squeeze in the only 3-coach commuter train and standing all the way for 1½ hours from Arau Train Station in Perlis to Butterworth Integrated Station in Penang. It is an integrated station because it's an express bus terminal, local bus terminal, train station, taxi station, vehicle ferry terminal and passenger ferry terminal in one area. Luckily it's not too crowded as the time was outside of peak hours (6-8AM, 12-2PM, 6-9PM). It will be very crowded in peak hours, but it's normal on non-peak hours to have something like the picture below, which I took with one hand while holding the vertical bar with other hand. Now, I was supposedly to sit down while waiting for passenger ferry to come because usually it's the vehicle ferry that is coming frequently, but the seats are full so I stand still while waiting for the ferry. Usually it would take 30 minutes before another passenger ferry or mixed ferry arrive, unlike vehicle ferry where it came every 15 minutes. Adding that waiting of 30 minutes and the usual ferry route of 30 minutes, we get 1 hour for using the ferry. Now, the "walking" in Google Map is obviously wrong. It seems that it assume I could walk across the deep sea where even cargos are using that sea as its route. 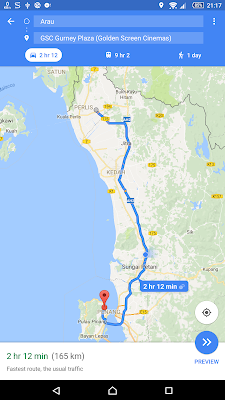 Also, I had to change the place name to their official names in Google Map, as apparently Google don't know that we just call these ferry terminals with their area names (Butterworth and Georgetown) thus screwed up the route system with unofficial names. Once arrived to Georgetown Ferry Terminal, I would just take the bus RapidPenang 101 or 103 or 104 to Gurney Plaza whichever came first as the time taken is almost the same for these buses, 1½ hours. Gurney Plaza is a very big shopping mall, as a foreigner to this mall, I would get lost easily and everytime I went there, I forgot the exact position of the cinema in the mall and had to look for it from their floor plans placed besides the escalators. Adding all times taken, it takes about 5 hours for one-way journey to the cinema. Hence, I usually plan very careful so the tickets are not sold out yet I could arrive in time for the screen. When I want to go back, it's just the reverse of the journey and another 5 hours is needed. I would also need to plan so I would arrive back to university before the curfew at 11PM or else I would have to sleep at the gate doors until it opened again around 6:00AM. I don't take much image on my phone because I'm afraid that the battery would used up before I'm able to get back to university after watching the anime movie, I don't have a power bank (backup battery) at that time and I relies heavily on Google Map's GPS which indeed uses much battery. 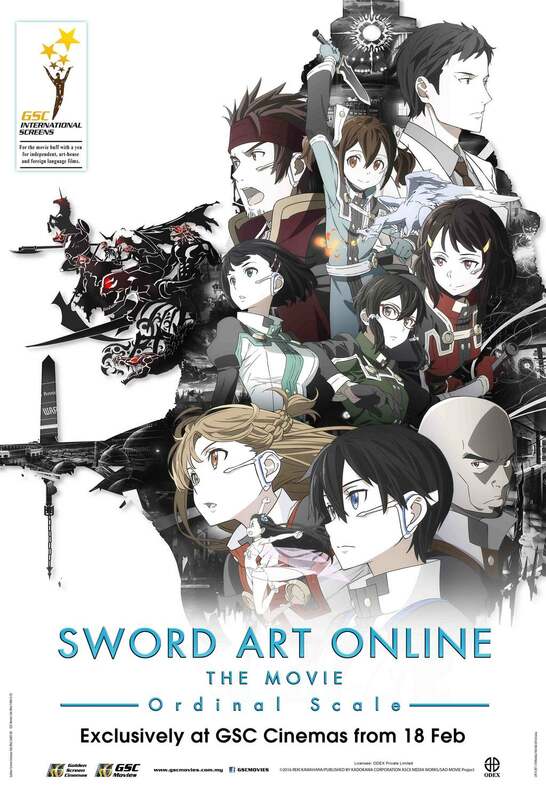 This movie was released on GSC cinemas in 18 February 2017 and this is one of the rare movies that did get to screen in GSC Aman Central Alor Setar, Kedah which is much nearer to Arau, Perlis compared to GSC Gurney Plaza, Penang for another anime I stated earlier. I went for the screen on 22 February 2017 as my only class on that day was cancelled in the morning. Again, all the suggested routes are for cars which does not apply to me. I've traced back the train rail lines on the screenshot (magenta coloured lines) so you could see the exact route I took. Yes, it's the commuter train again! But no ferry or bus this time. Just like explained earlier, I need to walk to the train station so that I don't need to pay for the taxi, RM10 for just a short distance. Again, I prepared to squeeze in the only 3-coach commuter train and standing all the way from Arau Train Station in Perlis to Alor Setar Train Station in Kedah. This time, it would only take 25 minutes of journey. This train journey only cost me RM3.90 one-way, much cheaper than the taxi from my room to Arau train station that I avoided which is RM10.00. After I arrived Alor Setar Train Station, I just walked slowly in the capital city of Kedah, Alor Setar. I would need to aware so no vehicles would knock me down while walking besides the roads or crossing them, as the roads there are very busy and confusing to non-natives with lots of one-way roads. It's not too hard to find the cinema itself once arrived to Aman Central. Welcome to AMAN CENTRAL. That first banner is GSC's banner! The larger paper with "Tax Invoice" text is actually the self-print ticket which could be used on automatic gates of the cinema, but it's my (and many other's) habit to collect the physical ticket (smaller ones) at counter by presenting the self-print ticket and use the physical ticket at manual gates because it looks cooler to share on social media and has more feeling when the person in charge checking our tickets at the gate (lol). The movie ended just a few minutes before the commuter train that I want to board supposedly arrive at Alor Setar Station. I ran with full of my ability so that I don't missed that particular train as that's the only train which could get me arrive Arau before the curfew. However, I just knew that the commuter train is delayed 15 minutes because of thunderstorm in Sungai Petani and Gurun (as all trains go through them), thus the train can't run at its full speed. The Electric Train (ETS) which was supposed to arrive 20 minutes earlier than commuter train has just arrived to the station when I get there, so the commuter train will arrive after the ETS and it did.